The stakes are higher than ever and "Turnaround: Third World Lessons for First World Growth" reveals the three things we need for a more prosperous future: Discipline, Clarity, and Trust. 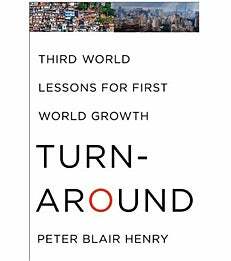 "A riveting tour of postwar world growth, replete with policy successes and devastating mistakes, Turnaround is essential reading for anyone willing to be convinced that learning should be a two-way street between advanced and developing economies." Thirty years ago China seemed hopelessly mired in poverty, Mexico had triggered the Third World Debt Crisis, and Brazil suffered under hyperinflation. But in recent decades, these and other developing countries have turned themselves around, while First World nations, battered by economic and fiscal crises, struggle to stay afloat. With the global economy teetering on the brink, America’s prosperity now depends on our ability to learn from these prior foreign struggles—and successes—with economic reform. Discipline: “It’s Not What You Think.” Discipline does not mean harsh or extreme positions, like insisting on fiscal austerity. Discipline is a sustained commitment to long-term prosperity that is vigilant, flexible, and values the entire population of a country over any one individual or group. Clarity: “Getting Past Ideology” Unique to Turnaround, revisiting the history of reform in developing countries through the lens of their stock exchanges helps to sidestep ideology and focus on facts. The data leave little doubt that countries that seek to increase growth and improve economic efficiency should favor market-friendly policies such as those urged by James A. Baker III in the 1980s. Trust: “Prosperity Is Not a Zero-sum Game.” Economic interdependence means that everyone will win or everyone will lose. The First World must turn around, and emerging markets must stay the course. But prosperity for all hinges critically on whether advanced nations acknowledge the achievements of emerging economies and give them a leadership role commensurate with their contributions to the global economy. Turnaround rejects tired, ideologically driven debates. Instead, Henry uses objective stock market analysis as an important complement to traditional measures of policy effectiveness. In doing so, he provides answers to the fundamental question: which policy reforms, implemented under what circumstances, actually increase economic efficiency and help countries make the most of their scarce resources? Turnaround delivers stories that demonstrate—from the drastic income disparity between Barbados and Henry’s native Jamaica, to the “catch up” economics of China and the taming of inflation in Latin America—how, in much of the emerging world, the policy pendulum now swings in the direction of prudence and self-control. With similar discipline, the First World may yet recover and create long-term prosperity for all its citizens. Peter Blair Henry is the Dean of New York University’s Stern School of Business and a former Professor of International Economics at Stanford University. In 2008, he led Barack Obama’s Presidential Transition Team in its review of international lending agencies such as the IMF and World Bank. A member of the board of the National Bureau of Economic Research, the Council on Foreign Relations, and the Kraft Foods Group, Peter received his PhD in economics from MIT and Bachelor’s degrees from Oxford University, where he was a Rhodes Scholar, and the University of North Carolina, where he was a Morehead Scholar and a finalist in the 1991 campus-wide slam dunk competition. Born in Jamaica, Peter became a US citizen in 1986. He lives in New York City with his wife of 17 years and their four sons. To speak with Mr. Henry, contact Rimjhim Dey of Publisez PR at rdey@publisez.com and 917-514-3359 or Paul Sliker of Publisez PR at psliker@publisez.com and 401-413-6344. For more information, please visit http://www.peterblairhenry.com.